Accurate data on prevalence rates of CMS are lacking as are population-based studies on prognostic factors associated with CMS. Previous studies suggest that the prevalence of CMS increases with altitude and age and that it is more common in men. Many studies have been conducted to determine prevalence rates of CMS in the Andes. ,,, Fewer studies have been conducted in the Himalayas and Tibetan Plateau. , Measuring the burden of CMS is important for HA researchers, clinicians and policy-makers. A better understanding of prognostic factors associated with CMS will also allow researchers to begin understanding the mechanism of CMS and develop more effective treatments for those affected by it. In this study, we therefore, attempt to address these shortcomings in the study of CMS. We surveyed 83 adults (17-75 years old) in eight towns across the remote, HA districts of Sirmaur, Kinnaur and Lahaul and Spiti in the state of Himachal Pradesh, India. All villages were located at an altitude of 2350 m or higher: Churdhar (3500 m), Rekong Peo (2350 m), Kalpa (2760 m), Pooh (2800 m), Nako (3630 m), Tabo (3285 m), Kye Monastery (3900 m), and Kibber (4150 m). We collected data on patient characteristics including length of residence at HA, socio-economic status, age, and gender. The study conformed to the principles outlined in the Declaration of Helsinki. Verbal informed consent was obtained from the subjects. All surveys were administered in Hindi or English as per the subject's preference. We also completed a medical history including information on current and past medical issues, history of cardiovascular disease, alcohol use, and tobacco use. Alcohol consumption was divided into six categories: (1) Equal to or greater than once per day, (2) equal to or greater than once per week, (3) equal to or greater than once per month, (4) equal to or greater than once per year, (5) unspecified or (6) none. As only a minority of South Asians consume tobacco through cigarettes, with chewing tobacco and beedi (an inexpensive tobacco product common in South Asia and parts of the Middle East) being more popular, pack definitions were variable. For cigarettes, a pack was defined as 20 cigarettes, a pack of beedi was defined as 12 sticks and a pack of chewing tobacco was defined as one container of tobacco. CMS was diagnosed through a modified CMS scoring system. The original scoring system for the diagnosis of CMS was originally created by a consensus panel of experts at the VI World Congress on Mountain Medicine and HA Physiology in Xining, China. In the original scoring system final CMS scores include information from hemoglobin levels. As we had limited resources we were unable to perform blood sampling and therefore, this component of the score was removed and the cut-off criteria were adjusted to account for this. This revised scoring system, which excludes hemoglobin measurements, was recently found to be equally effective at identifying CMS as the original Qinghai system. We assessed the following seven signs and symptoms of CMS: (1) Breathlessness and/or palpitations, (2) sleep disturbance, (3) presence of cyanosis, (4) dilatation of veins, (5) paresthesias, (6) headaches, and (7) tinnitus. A value of 0 was assigned to negative answers and values from 1, 2, and 3 to positive answers (mild, moderate, and severe, respectively). In addition to the survey, oxygen saturation (SpO 2 ) and pulse rate were recorded from the index finger using a Nonin GO 2 Model 9570 (Nonin Medical, Inc., Plymouth, MN, USA). All measurements were undertaken by researchers with experience using this device. Altitude was recorded by a portable altimeter (Casio 3172 PAW-2000) and cross-verified by satellite imaging software (Google Earth Version 5.1.3533.1731). 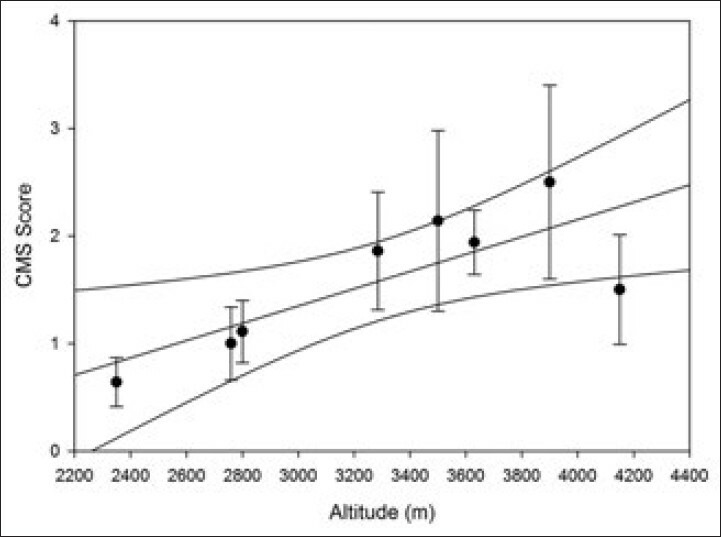 Altitude measurements reported in this paper are from the satellite imaging software. All statistical analyses were completed using Systat Software SigmaPlot 12.0 (Build 12.2.045). Unpaired t-tests were used for parametric comparisons of two groups and Rank-Sum tests for non-parametric comparisons. Multiple group comparisons were analyzed with one-way ANOVA for parametric data and Kruskal-Wallis one-way ANOVA on ranks for non-parametric data. Shapiro-Wilk tests were used to determine normality. Pearson product moment or Spearman rank order tests were used to determine correlations for parametric and non-parametric data, respectively. Fisher's exact tests were used for the analysis of contingency tables (comparison of variables in CMS and non-CMS groups). All results in this paper are reported as mean ± standard error of mean unless otherwise indicated. The average age of the 83 people surveyed was 35.6 ± 1.3 years of which 69 were males. There were significant differences in gender across towns (P = 0.0035) although no significant differences in age were observed (P = 0.457) [Table 1]. The average altitude was 3281 ± 58 m. There was no significant correlation between altitude and age (R = 0.0728; P = 0.512). Five people (6.02%) had spent < 5 years at HA (>2000 m) immediately prior to the study. The majority of subjects (74.39%) had spent > 80% of their lives at HA and 71.95% of subjects had spent their entire lives at HA (>2000 m). In regards to permanent habitation, 76 subjects (91.57%) permanently live at HA with the remaining 8.43% returning to lower altitudes (<2000 m) throughout the year. On average, individuals had spent 29.68 ± 1.79 year at HA (>2000 m). Individuals who permanently resided at HA (>2000 m) lived at significantly lower altitudes than individuals who did not permanently reside at HA (3273.62 ± 70.07 m for permanent residents and 3722.86 ± 104.11 m for non-permanent residents; P < 0.01). The average SpO 2 at a mean altitude of 3281 m was 90.7 ± 0.4%. The average resting pulse rate was 80.3 ± 1.3 bpm. The minimum recorded SpO 2 was 75% and the maximum was 97%. Minimum pulse rate was 54 bpm and the maximum was 110 bpm. There was significant difference in SpO 2 across towns (P < 0.0001) although no differences in pulse rate were observed [Table 2]. 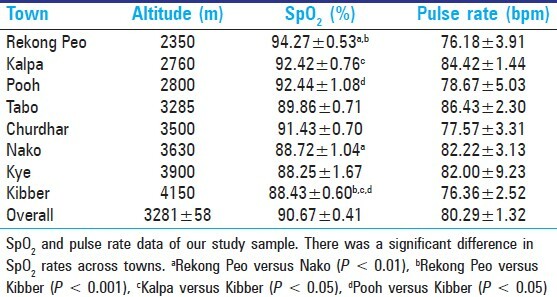 SpO 2 significantly correlated with altitude (R = −0.929; P < 0.000001) such that at higher resident altitudes average SpO 2 values were lower, as expected [Figure 1]. A trend towards a significant relationship between SpO 2 and pulse rate existed (R = −0.195, P = 0.080) existed such that individuals with higher upright pulse rates recorded lower SpO 2 values. 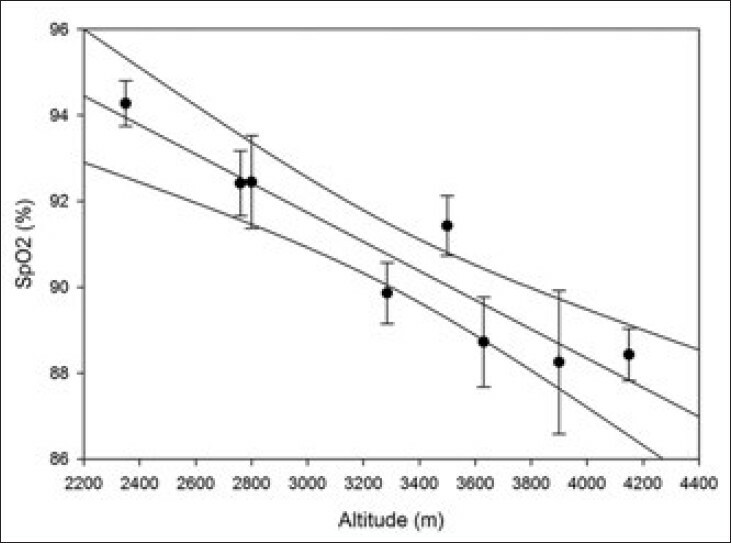 There was no significant correlation between altitude and pulse rate (R = −0.02065, P = 0.8539). Of 81 subjects in which CMS scores were available the average CMS score was 1.51 ± 0.17. When using our adjusted CMS scoring system 93.83% of subjects did not have CMS, whereas 6.17% had mild CMS. We found no moderate or severe cases of CMS. There were no significant differences in CMS scores between towns (P = 0.161) [Table 3]. Most frequently occurring symptoms were headache (33.3%) followed by tinnitus (30.9%), paresthesia (13.6%), breathlessness (8.6%), cyanosis (7.4%), and sleep disturbances and dilatation (4.9% each), respectively. A significant correlation existed between altitude and average CMS scores (R = 0.784, P = 0.0213) such that at increasing altitudes average CMS scores were higher [Figure 2]. 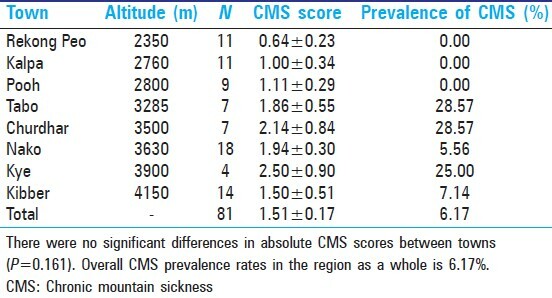 Furthermore, when prevalence of CMS was divided by altitudes above and below 3000 m, no cases of CMS were observed at altitudes below 3000 m. Prevalence rates at or above this altitude were 13.73%. The average CMS score below 3000 m was 1.03 ± 0.20 and the average score at or above 3000 m was 1.85 ± 0.25 [Table 4]. We found no significant difference in gender between those with and without CMS (P = 0.2043). There was no significant difference in age between those with and without CMS (29.60 ± 2.6 year vs. 36.08 ± 1.4 year, respectively; P = 0.095). Individuals with CMS 'lived at higher altitudes than their non-CMS counterparts (3736.00 ± 113.30 m vs. 3279.80 ± 69.50 m, respectively; P = 0.017). All individuals with CMS had spent their entire lives at HA, whereas only 68.92% of individuals without CMS had spent their entire lives at HA. A significant correlation existed between absolute CMS scores and percentage of life subjects had spent at HA (R = 0.364, P = 0.000991). In a contingency table analysis, there was no significant difference in percentage of a life spent at HA between individuals with and without CMS (P = 0.3150). Furthermore, there were no significant differences in permanent HA habitation rates between individuals with and without CMS (P = 0.3713). Of the 82 people who answered questions regarding tobacco consumption, 29 (35.4%) said they consumed tobacco. When individuals were divided into those with CMS and those without, we found no significant difference in tobacco consumption (P = 0.3270). Of the 79 people who answered questions regarding alcohol consumption, 34 (43.0%) said they consumed alcohol and 45 (57.0%) did not. There was no difference in alcohol consumption between CMS-positive and CMS-negative groups (P = 0.3212). There was no significant correlation between CMS score and SpO 2 (R = −0.1167, P = 0.2995) or CMS score and pulse rate (R = 0.08099, P = 0.4723). When individuals were divided by the absence or presence of CMS, no differences in SpO 2 (90.61 ± 0.43 vs. 91.00 ± 1.02, respectively, P = 0.759) and pulse rate (80.53 ± 1.40 vs. 77.60 ± 4.25, respectively, P = 0.582) were observed. There was no significant correlation between CMS score and occupation (P = 0.843), education (P = 0.342) or monthly income (R = 0.0390, P = 0.740). When individuals' occupations were divided into manual labor occupations and administrative/professional occupations there were still no differences in CMS scores (P = 0.448) between the two groups. However, when individuals were divided by the presence or absence of CMS, individuals with CMS had significantly lower incomes than individuals without CMS (2875.00 ± 844.48 INR vs. 8566.87 ± 877.27 INR, respectively, P = 0.002). Medical history data were available for 82 subjects. There were no differences in reported rates of current health issues (P = 0.8144), previous health issues (P = 0.8792), history of cardiovascular disease (P = 0.8265), family history of cardiovascular disease (P = 0.6485) and medication use (P = 0.9186) between individuals with and without CMS. In our study of factors associated with CMS, we found no relationship between CMS, gender and age. However, other studies seem to show that older age is an independent risk factor for CMS. Leσn-Velarde et al. identified age and obesity as risk factors for CMS. Increased age has also been identified as an aggravating factor for CMS in several studies. ,,,, Lifestyle and environmental pollution are also thought to be implicated in the development of CMS. , Negi et al., in a study of 694 people in a similar region to the area we conducted our study, found that the prevalence of CMS was higher in a woman than in men. In their study, they also found advanced age, truncal obesity, altitude of residence and physical activity index were independent predictors of CMS. It is possible that the relatively young age and overwhelming male gender in our sample made it difficult for us to tease out independent gender and age-related risk factors for CMS etiology. Although Negi et al. study found a greater prevalence among females, older studies seemed to find the opposite, although historically most CMS studies were performed on male subjects only and the Negi et al. study had a higher proportion of females in their sample (62.3% females). One study examining CMS in the Peruvian central Andes found no differences in CMS scores between genders although they did observe a significantly higher prevalence of EE in men when compared to women (17.2% vs. 6.3%, P = 0.0003). Similar differences in gender when comparing polycythemia have been found in elderly men of the highland region of Qinghai, China. The associations between various risk factors and CMS are not well elucidated although it appears older age and perhaps, male gender are risk factors for the presence of CMS. We found no correlation between CMS and socio-economic factors such as occupation, education and monthly income. Interestingly, however, when divided by CMS presence or absence, the CMS-positive group had significantly lower incomes than the CMS-negative group (2875.00 ± 844.48 INR vs. 8566.87 ± 877.27 INR). It is possible that, like other health problems, people with limited resources have decreased access to healthcare and consequently increased burden of disease. Historically research on CMS has been lacking although more recently there has been a push to increase awareness about this issue. Minimal interest in studying CMS means we have limited data on prevalence and incidence rates of CMS in HA regions of the world. In our study of the remote Eastern Districts of Sirmaur, Kinnaur and Lahaul and Spiti of Himachal Pradesh, India, we recorded a CMS prevalence rate of 6.17%. At altitudes at or above 3000 m, we recorded even higher rates of 13.73%. A study by Norboo et al. in 2004 measured CMS in 84 individuals who lived at an altitude of 4647 m in the district of Ladakh in the Northern State of Jammu and Kashmir, India. They recorded a CMS prevalence rate of 4.87%, including some moderate and severe cases of CMS. By comparison, all cases of CMS in our study were mild. Norboo et al. included hemoglobin measurements which allowed them to more accurately assess CMS. Like our study, they found that none of their CMS patients smoked or had a history of cardiovascular disease. Lower prevalence in the Norboo et al. study could be a result of the ethnic background of Himachalis in our study in comparison to the Ladakhis in their study. It could also be due to differences in the CMS scoring system used as the formal consensus CMS scoring system wasn't developed at that time. A recent large-scale epidemiological study by Negi et al. examined CMS in 694 subjects free of cardiorespiratory disease in the Spiti Valley of Eastern Himachal Pradesh in the Indian Himalayas. Between altitudes of 3000 and 4200 m they recorded CMS prevalence rates of 28.7%. Moderate to severe CMS was observed in 4.9% of the population. They found that CMS was significantly higher in women. Age, central obesity, and female gender were independent predictors for CMS. Hypertension, tobacco consumption and pulmonary function were not associated with CMS in their study. In general, it appears that prevalence rates of CMS in HA dwellers on the Tibetan Plateau are much lower. CMS rates in this region range from 0.91% to 1.2% in native Tibetans compared to 5.6% in immigrant Chinese Han populations. , Studies from elsewhere in Asia have predominantly come from Kyrgyzstan. Studies in the Tien-Shan and Pamir Mountains (3000-4200 m), although not measuring CMS prevalence rates per se, found prevalence of HA cor pulmonale (indicative of maladaptation to HA) of 4.6% in the male population. Barring the results of Tibetans on the Tibetan Plateau then, it appears that most studies of other Asian populations have recorded CMS rates between approximately 4% and 7%; the only exception being one study that found CMS prevalence to be closer to 29%. The reasons for this large variability are not well-understood although ethnic differences in the various Himalayan populations and differences in the calculation of CMS scores may contribute. For example, previous studies comparing CMS rates in Han Chinese against Tibetans have found significant differences such that ethnic Tibetans have significantly lower rates of CMS when compared to immigrant Han Chinese populations. Therefore, there is evidence in the literature that ethnicity plays a role in the etiology of CMS. More extensive research into the prevalence of CMS has been conducted in the Andes. Several studies have examined CMS prevalence rates in Andean countries. Many studies in the Andes come from Peru and the mining town of Cerro de Pasco in central Peru (4300 m). Peruvian investigators in Cerro de Pasco recorded an average cross-sectional EE rate (a closely related marker of CMS) of 15.6% in male miners who resided there. The prevalence of EE in their study increased from 6.8% in the youngest group (20-29 years of age) to 33.7% in the oldest group (60-69 years of age). , Other studies in Cerro de Pasco have found CMS prevalence rates of 14.8% and 18.2%. , Elsewhere in the Andes Bolivian investigators studying CMS in the male population of La Paz, Bolivia (altitude 3600 m) reported a CMS prevalence of 6-8%. Other studies from La Paz have reported similar rates of CMS with one study measuring a rate of 5.2%. In Bolivia as a whole approximately two-thirds of the population live at altitudes greater than 3000 m and CMS is deemed a considerable public health problem. Studies there have found CMS rates between 8% and 10% in the male active population in the country. In general, CMS rates in the Andes are higher than CMS rates in the Tibetan Plateau, on par or slightly higher than rates in other parts of the Himalayas and higher still than rates in the East African Mountains. Few studies have examined CMS prevalence in the East African Mountains. In this region most research has been conducted in the highlands of Ethiopia where, by some measures, natives there appear to be the best adapted for life at HA. Several studies examining physiologic adaptation to HA in Ethiopia have noted absence of CMS in this region of the world. For example, Appenzeller et al. encountered no individuals with CMS in their study of cardiovascular and genetic changes to hypoxia. In their study, CMS scores were significantly lower in Ethiopians than in Andean populations (0.3 ± 0.5 vs. 11.6 ± 8.5; P < 0.01) and no Ethiopian subject received a score diagnostic of CMS. Similar findings were observed in other studies. , More in-depth epidemiologic studies of CMS prevalence in the Ethiopia and other parts of the East African Mountains are warranted. Previously differences in CMS rates between the Himalayas and Andes were believed to be due to variation in settlement patterns in the two regions. In the Himalayas, for example, it was argued that permanent settlements could be established at lower altitudes even though the mountain range as a whole is much higher. It was believed that this could account for the lower hemoglobin levels found in Sherpas and Tibetans. More recent evidence, however, suggests that although this is true of the Sherpas in Nepal it does not hold true for Tibetans of the Tibetan Plateau. On the Qinghai-Tibetan Plateau one cannot move easily from higher to lower altitudes. A 2001 study by Wu found that 51.3% of the Tibetan population (4,594,188 people) live above 3000 m with 20% living permanently above 4000 m and 1.02% living above 5000 m.  These settlements are considerably higher than many permanent settlements in the Andes. It is, therefore, likely that difference in CMS and adaptation to HA have more to do with genetic difference than in settlement patterns. Outside of the Himalayas our SpO 2 values were comparable to Ethiopian populations at similar altitudes (88.0 ± 3.2% at 3622 m) even though CMS rates were considerably lower in the Ethiopian populations. As described earlier, the differences in CMS scores despite similar SpO 2 could be due to differences in adaptation to hypobaric hypoxia. Penaloza and Arias-Stella nicely summarize SpO 2 values in HA cities around the world. In general, below 3000 m SpO 2 values around the world were 90% or higher. At Cerro de Pasco, Peru, SpO 2 values of 81% were recorded. Higher still at Morcocha, Peru (4540 m) SpO 2 values of 78% were recorded. Leadville, Colorado in the USA is at an altitude of 3100 m, similar to the mean altitude of our study. At Leadville, USA Grover recorded a mean SpO 2 of 89%; similar to the 90.67% observed in our study at a similar altitude. Given the large variability in ethnicities around the world but the similarities in SpO 2 it is possible that ethnicity has less of an impact on etiology of hypoxemia than of prevalence of CMS. This study suffered from several limitations. Due to limited resources we were unable to measure hemoglobin levels to assess CMS. However, a recent study by Gonzales et al. found that elevated hemoglobin levels were not associated with elevated scores of signs and symptoms of CMS whereas CMS symptoms scoring alone better reflected overall health. The authors of this study questioned the inclusion of EE as a measure in the Qinghai CMS scoring system. A second limitation was that as we had only a short time to conduct this study we were only able to stay in each town for a short period of time, yielding lower than hoped for recruitment. The study also oversampled men and younger people which could have influenced our results. Finally, according to the consensus statement on CMS scoring  a diagnosis of CMS should not be made in persons with chronic pulmonary diseases or other underlying chronic medical conditions that are worsened with hypoxemia. Lung function testing is normally recommended to confirm normal respiratory function. In general, this study provides important information regarding prevalence of CMS in the Indian Himalayas and helps expand our understanding of the burden of CMS around the world. We would like to thank Mr. Vishal Panwar for his assistance in data collection. We would also like to thank the many subjects who volunteered their time for this study. 1. Gonzales GF, Rubio J, Gasco M. Chronic mountain sickness score was related with health status score but not with hemoglobin levels at high altitudes. Respir Physiol Neurobiol 2013;188:152-60. 2. Penaloza D, Arias-Stella J. The heart and pulmonary circulation at high altitudes: Healthy highlanders and chronic mountain sickness. Circulation 2007;115:1132-46. 3. León-Velarde F, Maggiorini M, Reeves JT, Aldashev A, Asmus I, Bernardi L, et al. Consensus statement on chronic and subacute high altitude diseases. High Alt Med Biol 2005;6:147-57. 4. Pasha MA, Newman JH. High-altitude disorders: Pulmonary hypertension: Pulmonary vascular disease: The global perspective. Chest 2010;137 6 Suppl: 13S-9. 5. Rivera-Ch M, León-Velarde F, Huicho L. Treatment of chronic mountain sickness: Critical reappraisal of an old problem. Respir Physiol Neurobiol 2007;158:251-65. 6. Arregui A, León-Velarde F, Cabrera J, Paredes S, Vizcarra D, Umeres H. Migraine, polycythemia and chronic mountain sickness. Cephalalgia 1994;14:339-41. 7. Monge-C C, Arregui A, León-Velarde F. Pathophysiology and epidemiology of chronic mountain sickness. Int J Sports Med 1992;13 Suppl 1:S79-81. 8. Norboo T, Saiyed HN, Angchuk PT, Tsering P, Angchuk ST, Phuntsog ST, et al. 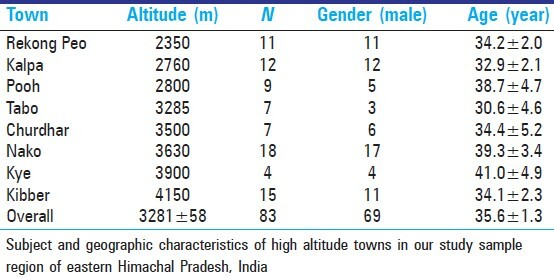 Mini review of high altitude health problems in Ladakh. Biomed Pharmacother 2004;58:220-5. 9. Wu TY, Li W, Li Y, Ri-Li G, Cheng Q, Wang Z, et al. In: Ohno H, Kobayashi T, Masuyama S, Nakashima M, editors. Progress in Mountain Medicine and High Altitude Physiology. Matsumoto, Japan. Dogura and Co. Ltd.; 1998. p. 120-5. 10. Sahota IS, Panwar NS. A pilot study on the prevalence of Acute Mountain Sickness at the Sikh pilgrimage of Hemkund Sahib in the Indian Himalayas. Indian J Occup Environ Med 2013;17:12-5. 11. León-Velarde F, Arregui A, Vargas M, Huicho L, Acosta R. Chronic mountain sickness and chronic lower respiratory tract disorders. Chest 1994;106:151-5. 12. Kryger M, McCullough RE, Collins D, Scoggin CH, Weil JV, Grover RF. Treatment of excessive polycythemia of high altitude with respiratory stimulant drugs. Am Rev Respir Dis 1978;117:455-64. 13. Normand H, Vargas E, Bordachar J, Benoit O, Raynaud J. Sleep apneas in high altitude residents (3,800 m). Int J Sports Med 1992;13 Suppl 1:S40-2. 14. Bernardi L, Roach RC, Keyl C, Spicuzza L, Passino C, Bonfichi M, et al. Ventilation, autonomic function, sleep and erythropoietin. Chronic mountain sickness of Andean natives. Adv Exp Med Biol 2003;543:161-75. 15. Spicuzza L, Casiraghi N, Gamboa A, Keyl C, Schneider A, Mori A, et al. Sleep-related hypoxaemia and excessive erythrocytosis in Andean high-altitude natives. Eur Respir J 2004;23:41-6. 16. Sun S, Oliver-Pickett C, Ping Y, Micco AJ, Droma T, Zamudio S, et al. Breathing and brain blood flow during sleep in patients with chronic mountain sickness. J Appl Physiol (1985) 1996;81:611-8. 17. Frisancho AR. Origins of differences in hemoglobin concentration between Himalayan and Andean populations. Respir Physiol 1988;72:13-8. 18. Negi PC, Asotra S, V RK, Marwah R, Kandoria A, Ganju NK, et al. Epidemiological study of chronic mountain sickness in natives of Spiti Valley in the Greater Himalayas. High Alt Med Biol 2013;14:220-9. 19. Okumiya K, Sakamoto R, Kimura Y, Ishine M, Kosaka Y, Wada T, et al. Comprehensive geriatric assessment of elderly highlanders in Qinghai, China II: The association of polycythemia with lifestyle-related diseases among the three ethnicities. Geriatr Gerontol Int 2009;9:342-51. 20. Ge RL, Helun G. Current concept of chronic mountain sickness: Pulmonary hypertension-related high-altitude heart disease. Wilderness Environ Med 2001;12:190-4. 21. Monge C, León-Velarde F, Arregui A. Increasing prevalence of excessive erythrocytosis with age among healthy high-altitude miners. N Engl J Med 1989;321:1271. 22. Vargas E, Spielvogel H. Chronic mountain sickness, optimal hemoglobin, and heart disease. High Alt Med Biol 2006;7:138-49. 23. Richalet JP, Rivera M, Bouchet P, Chirinos E, Onnen I, Petitjean O, et al. Acetazolamide: A treatment for chronic mountain sickness. Am J Respir Crit Care Med 2005;172:1427-33. 24. Appenzeller O, Claydon VE, Gulli G, Qualls C, Slessarev M, Zenebe G, et al. Cerebral vasodilatation to exogenous NO is a measure of fitness for life at altitude. Stroke 2006;37:1754-8. 25. Beall CM. High-altitude adaptations. Lancet 2003;362 Suppl: s14-5. 26. Hainsworth R, Drinkhill MJ. Cardiovascular adjustments for life at high altitude. Respir Physiol Neurobiol 2007;158:204-11. 27. Heath D, Williams DR. High Altitude Medicine and Pathology. Vol. 53. London, UK: Butterworths; 1989. p. 161-2. 28. Wu T. The Qinghai-Tibetan plateau: How high do Tibetans live? High Alt Med Biol 2001;2:489-99. 29. Grover RF. In: Fishman AP, editor. The Pulmonary Circulation: Normal and Abnormal. Philadelphia, USA: University of Pennsylvania; 1990. p. 283-99.